Electronics expert Steve Braithwaite has consulted for startups and companies on over 50 designs in his role as founder and Chief Technology Officer of ASH Wireless Electronics. 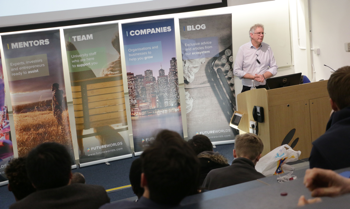 Last week he detailed some of the secrets behind entrepreneurial success and the mistakes that lead to lasting business ‘scars’ in an instructive Mentor Masterclass session. Watch his full talk in the video [below] or read on for Jon Nurse’s blog from the event. This article’s quotes have been generated using the Synote University spinout transcription tool. What does a pair of wireless speedway goggles, a blind spot cyclist detection system and child locator bracelet all have in common? They are all gadgets that have been nurtured towards development by Steve Braithwaite and his growing electronics consultancy. Steve describes himself as a “fellow traveller” in startups’ journeys to global markets, and he has the scars to prove it. Building, refining and launching a product can be a bruising experience. ASH Wireless has been dedicating up to a third of its staff’s time to help “realise entrepreneurs’ dreams” since its launch in 2001 and the business has inevitably seen its share of successes and disappointments over the years. Steve joins entrepreneurs at varying stages of their product journey as they define, design and prototype their idea ahead of revisions for production, verification, certification and manufacture. “There are a variety of different ways to get a product out there. “One possibility when you have a bright idea is to do a proof of concept either as a studentship or in your own evenings and then try to get it out and license it to a company that would invest in it and take it on. “Another option is to go it alone. You might know that you’ve got the skills, or can get hold of some friends, colleagues and family to muck in, so that you can get the design produced to a particular point where a manufacturer can go and take it into volume. It’s very hard work to do that and is normally slow but at the same time it has a lowish development cost. Steve recommends entrepreneurs pay special attention to communication during the product development process to avoid any unexpected outcomes. “It’s astonishing how different the word prototype can actually mean between an engineer and a customer,” he explained. “One of our very first customers wanted to see a prototype so we produced a square plastic casing with an additional bit built onto it. Of course, his view of a prototype was the kind of thing you see at the Birmingham Motor Show, looking absolutely fantastic. 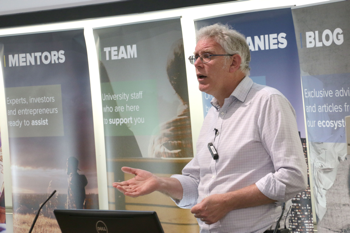 Innovators will always face hurdles as they bring their products towards market and Steve recounted over half a dozen startup stories from his time at ASH Wireless that University entrepreneurs can learn from ahead of their own business adventures. An inventive speedway goggle system impressed Steve in another startup story, but the business ultimately struggled to scale when it came to manufacture. The goggles were a hands-free solution to the problem of mud being sprayed into the face of racers, using a wireless electronic roll-off system.goggle system impressed Steve in another startup story, but the business ultimately struggled to scale when it came to manufacture. The goggles were a hands-free solution to the problem of mud being sprayed into the face of racers, using a wireless electronic roll-off system.speedway goggle system impressed Steve in another startup story, but the business ultimately struggled to scale when it came to manufacture. The goggles were a hands-free solution to the problem of mud being sprayed into the face of racers, using a wireless electronic roll-off system. So has Steve’s catalogue of scars put him off journeying with startups? Entrepreneurs are bound to experience several successes and scars in their future but, with support of Future Worlds Mentors such as Steve, they can start to ‘know what they don’t know’ and go on to change the world with their ideas. The Future Worlds Mentor Masterclass series will continue this month with crowdfunding specialist Chris Buckingham. Visit the Future Worlds Engage section to book your free place. Read more about Steve’s experience and find out what he can offer aspiring University entrepreneurs on his Future Worlds Mentor profile.